Are you a ‘good networker’? Do you go to local groups and meetings diligently? Do you try to make sure to talk to everyone? Do you do all the follow ups, and phone calls and coffee dates? Do you have enough business cards in your car to throw your back out? If you’re reading all the books and following all the advice perfectly, I have some bad news for you. You’re probably a bad networker and If people are remembering you, they’re probably mostly just remembering to keep you away from their clients. Now, before I go on, I just want to provide a little content warning: I’m not sugar coating this message. Networking is an incredibly powerful force for business owners, professionals and anyone who needs to promote themselves or something they do—but only if you’re the kind of networker people want to network with. So, let’s talk about this, lets air out some dirty laundry, because pretty much everyone I’ve ever spoken to about networking candidly agrees—people who do the kinds of things I’m going to write about here are a big part of the reason we don’t like networking. Now, I don’t claim to be an expert in ‘networking’, and what networking means for various industries is going to differ. So, as with anyone’s opinion, take it with a grain of salt; If something you do while networking makes people want to avoid you, but it’s really working for you anyway, well, don’t let me stop you. So, today, I’m going to share what I, and the couple dozen or so people I’ve spoken to about this, agree are among the worst networking behaviors. Behaviors that you may have been ill-advised to take up. When you do this, you become the walking equivalent of spam. You might be tempted to defend this behavior saying “that’s what people go to networking events for!”. And, yes, that would be technically true, in the same way that getting a barrage of emails from Cosco is what people ‘asked for’ when they signed up for the Target newsletter. Professionals and business owners go to networking events to form relationships in the hopes that some of them will go into the deep waters of mutual benefit. They’re looking for the right people—people they can sincerely help, and people who can sincerely help them. When you play networking like it’s a numbers game, you alienate yourself from the wellspring that produces profound and lasting referrals: genuine friendship. Don’t go to networking to sell things. Go to networking to make ‘friends’. And when you get there, never give someone a business card before you’re sincerely interested in getting theirs. Having a well rehearsed pitch, an ‘elevator pitch’, is important. 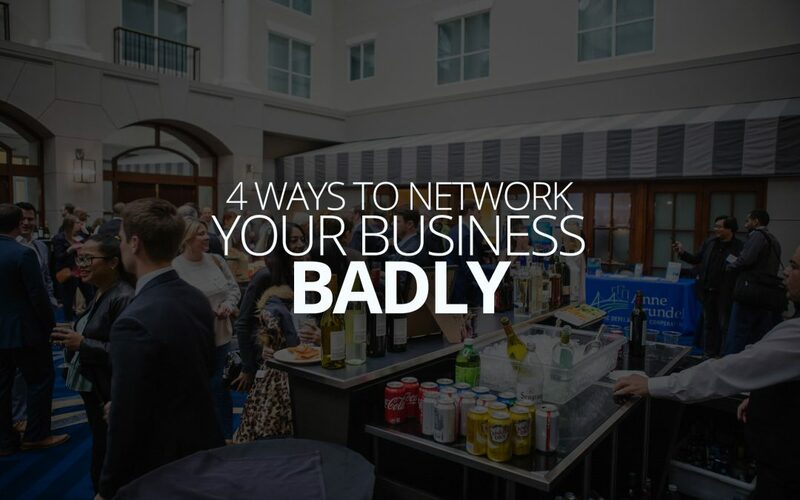 There are numerous contexts where you’re expected to have a one-way conversation about what you do and why and how, and you’re expected to do it quickly and memorably, but your everyday networking event is not one of them. Using that pitch in the context of a networking event that is made up mostly of two-way conversations smells phony. That well-rehearsed pitch is about as effective as the 15 second ad that runs before the YouTube video you actually want to see. That is to say, if you gave people a skip button, they’d press it. People can typically tell when you’ve switched into autopilot, and they haven’t been given a reason to care about the content your pitch yet, so they tune out. Yes, they’ll nod politely, but they’re probably just waiting for you to show back up in the conversation—or maybe looking for a window to leave through (“oh, looks like my drink is empty. I’ll be right back. Yeah, totally be right back.”). The truly best networkers are practically competing with each other, not to get their name out there to the most people, but to ask the best questions. So when you go networking, only talk about yourself when other people ask you, and look for people who only really talk about themselves when you ask them. Here’s the thing, people tend to want to connect with those who are passionate about what they do, and who are good at what they do, and to some ambiguous extent, successful at what they do. If there’s some networking group that meets every single Tuesday, and you’re there every single time, and especially if you pair that with the two previous points, that’s probably not the impression you’re sending. If your networking schedule works out so that you can comfortably attend events on a very regular basis, decide to set your immediate business interests aside and make yourself a rock solid resource within the group. Become a person who helps newcomers strike up a conversation. Slowly get to know everyone personally. In other words, let your behavior demonstrate why you’re there all the time—just make sure that reason is a service to this networking community. People have a tendency to go networking when times get tough. Then, when they decide to go, anxiety leads them to start doing the kinds of things I’m writing about here. They’re so (perhaps justifiably) fixated on their own problems and trying to solve them, that they get to networking and they give out a gazillion cards and they use their perfectly polished pitches over and over again and they never ever miss a meeting and… they still don’t end up making much progress. That’s because networking, real networking, the kind that turns into resilient, long-lasting personal and professional growth, is a very long game. You can’t network today for business tomorrow—sure that might happen once in a while, but not at all reliably—you have to network today for business next month, or next year. That is why it’s so important to eschew the ‘common sense’ around networking to just focus on genuine, although imperfect, human relationships. These people you meet at networking events don’t want to buy something from you, and I mean that categorically: People who choose to go networking are not looking for something to spend money on; they are, on some level, only looking to make money. Networking for next month or next year means finding people you sincerely connect with on some personal or professional level, and helping to bring them value through your knowledge, or connections, or experience, or friendship. It means forming some connection on a personal level, finding some reason for a friendship or association to exist besides your own needs. It means forming relationships that might still persist even if you quit your job or closed down your business. That is the networking gold standard, and some version of that is what every really good networker is doing.